Nearly 400 banks, credit unions and other financial institutions terminated relationships with 1,292 marijuana-related businesses across the country from February 2014 through January 2015, according to information from the Financial Crimes Enforcement Network (FinCEN). That equates to an average of 100 terminations per month, underscoring the challenges marijuana companies still face in landing and keeping bank accounts. Financial institutions are required by federal law to file Suspicious Activity Reports (SARs) with FinCEN whenever anyone using their services engages in a flagged activity that could involve money laundering or other illegalities. Activities related to illicit substances have always been on the list of red flags, but FinCEN released some much-needed guidance early last year for banks working with cannabis-related companies. A SAR filing does not automatically result in termination of the relationship – that decision is at the discretion of the financial institution. Although it’s reasonable to assume most, if not all, of the Marijuana Priority filings resulted in terminated relationships, that number doesn’t encompass the whole picture of terminations. Clearly, hundreds of marijuana businesses that are obeying state law and the 2013 Cole Memo also lost their banking relationships. The data on marijuana-related SARs was released to Dynamic Securities Analytics via a Freedom of Information Act request. Unfortunately, FinCEN did not release many details about the SARs or financial institutions involved, so there’s no way to determine which states were involved or any other details around the decisions to terminate relationships with otherwise law-abiding businesses. 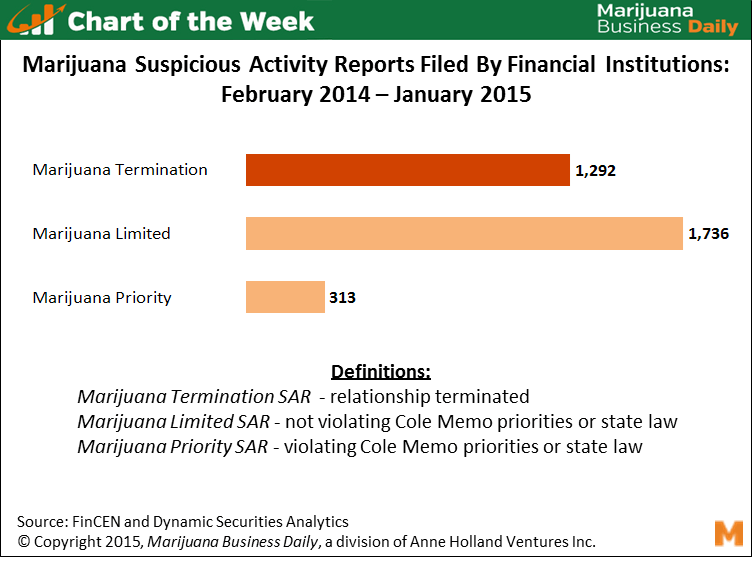 The data indicates that financial institutions are filing SARs on cannabis-related business that are in compliance with state law, thanks to marijuana’s continued illegality at the federal level. Institutions are not required to alert account holders when a SAR is filed – so the chances are that a SAR has been filed on many cannabis businesses lucky enough to have access to financial services. using the program those of pro-choice used back in 1973 as outlined in Revelation 9:1-12 and 21 of the bottomless pit of varied interpretations? Sound of their wings voices! So much noise was made that even child abuse in the 5th-9th months of gestation was legalised. How hard could it be for WE THE PEOPLE to run the Fed as it was meant to be, if everyone got their ducks together. After all we are not trying to kill or abuse anyone, just the right to use a life giving plant. Unite and it will all come together, delay and watch the Feds finish positioning themselves, at which time we will see our profits (monetary and humanitarian) go up in their smoke! It seems as though the Federal Government is using backhanded strategies to maintain the criminality of cannabis. When the reality of no breakdown in society or chaos in the streets became obvious after legalization, the powers that be have decided to force law-abiding citizens to continue in a black/gray market manner by banning banking for the industry. Is it merely a way to proclaim, “I told you so” or is it a response to the pressure from other industries with so much to lose from legalization?